A team of staff and students has proven its mettle by coming second out of 17 teams in an NHS-based military challenge. 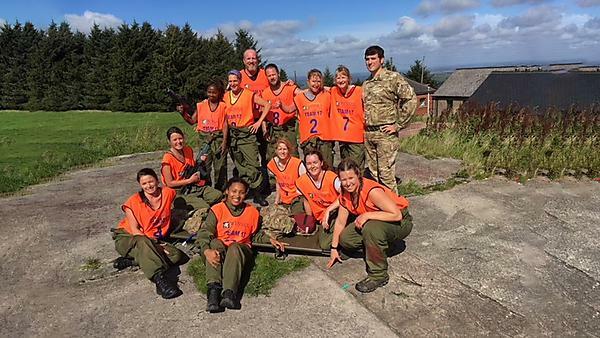 Made up of staff and students from adult nursing, child nursing, midwifery and paramedic practice, the team came a close second against teams from all over the region in the fourth annual South West Military Challenge. Taking place at Okehampton Camp on Dartmoor, the September weekend saw the team undertake a number of difficult and exciting exercises, including treating casualties under fire and a triage planning exercise. Most teams comprised of NHS staff, and each group was awarded points based on their time for completing each exercise and the members’ contribution. Clare Keenan, Lecturer in Paramedic Practice, explains why the challenge was such a success. Being a paramedic practitioner is a highly rewarding and stimulating career, with many opportunities to specialise. Following a curriculum that is informed by service users and carers, and focusing on quality patient management, you'll work in the unpredictable environment of pre-hospital healthcare and, as such, you will learn how to be dynamic with your decision-making, aptitude and application of skills.